VetTechPrep is unique in that it was built with faculty interaction in mind. Our faculty interface allows the class educator to log in and follow their students' progress through the program. Many schools have had incredible success using our program, preparing for the Veterinary Technician National Examination (VTNE®). We constantly work to keep our material relevant and up-to-date with the VTNE® standards. We believed so strongly that this on-line program would benefit not only our students but our pass rate statistics as well, that we include it in the curriculum. Our students, graduates, and staff find the program to be not only a testing exercise, but even more importantly, a learning platform. We use it live during the review class we hold for our graduates. The students can do individual questions by topic or we have fun taking the timed tests. The PowerPages are awesome teaching and review documents. I can highly recommend this product for other RVT schools. It stands alone in the testing arena. After doing a survey of my last class we have decided to remain with the VetTechPrep program. It has worked really well for our students, and have had a 100% pass rate since using it. Students will be required to purchase the program during the 1st week of class, and will also be encouraged to repurchase if need be before taking their VTNE®. During the last 4 hours of the course we use the practice questions and often the students compete in teams. The questions and answers are further discussed and expanded upon by the course mentors. The VetTechPrep course is a primary reason for our VTNE pass rate averaging between 80-100%. VetTechPrep is a fabulous supplemental program! We have tried other VTNE® prep solutions in the past with no luck. We are definitely satisfied with the results we have seen just in the two years we have been using VetTechPrep. I love the fact that I can monitor student progress and also be able to see where any weaknesses are. The majority of students that have utilized and completed the VetTechPrep have passed the VTNE. Students often tell me the VetTechPrep program really helped to prepare them. Our students did great! I am proud to say that for the fifth VTNE test window 100% of our grads passed! They love the program, the instructors love the prep course, and our pass rates have gone up since we started using it a couple years ago. As an adjunct faculty member I designed a review course for the students but when it became necessary to find an alternative means for review as we had numerous distance externship students who were unable to attend, I came across VetTechPrep. 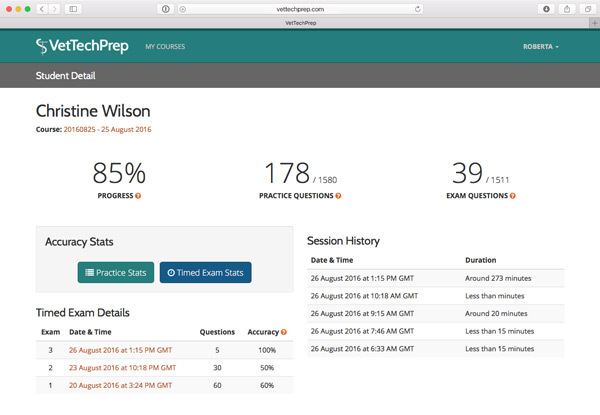 After testing numerous review options, I found VetTechPrep to be the most comprehensive. The aspects I find most helpful for the students are the expanse of questions offered, the ease of use, and PowerPages. Are discounts available to schools for bulk (class) subscriptions? When a school makes the purchase for its students (a bulk subscription), we do offer a discount to the school. Why can't I purchase one account for all of my students to share? Each individual student needs his or her own subscription to the program. 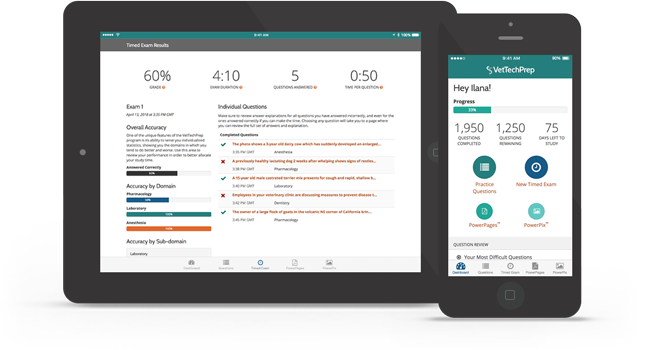 VetTechPrep is a self-paced review program that tracks individual statistics so each student can identify his or her own personal strengths and weaknesses. This allows the student to focus remaining study time on weaker areas. School administrators can use the faculty interface to view each individual student's progress through the program and monitor the weak areas in which they might need additional help. Please contact us so that we may assess your program goals. We can sign your school up with a contract that will best suit your needs. You can reach us at sales@vettechprep.com. Thank you for your interest in VetTechPrep! Our faculty interface allows the professor to log in and follow their students' progress through the program. Educators may see when their students have logged in, how much time they are spending in the program, and how they are performing on questions and timed exams. This helps identify weaker areas in which students may need additional review. We've redesigned the entire interface, providing even more information and better still, it's built for mobile devices too! 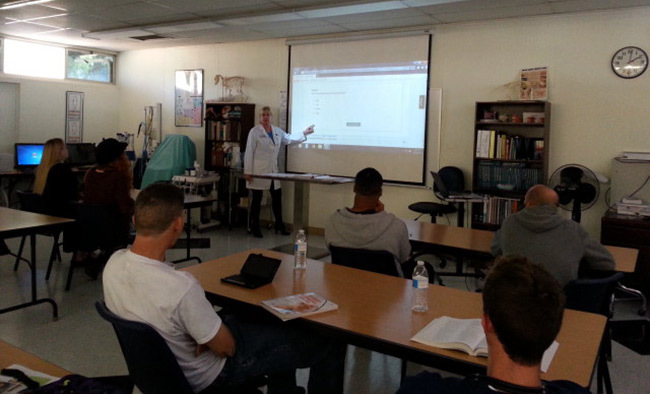 VetTechPrep can be used as a teaching tool in the classroom. It can help you to organize your students into sections and give you questions to review with the class. While the questions in each student's subscription are presented in random order, the exams may be printed by students and then turned in for credit. It can be used in many ways in order to suit your personal teaching needs. In today's busy world, technology is at our fingertips. Students can easily use their mobile devices to study with VetTechPrep on-the-go with our apps for iOS and Android, for that extra boost in VTNE® preparation. 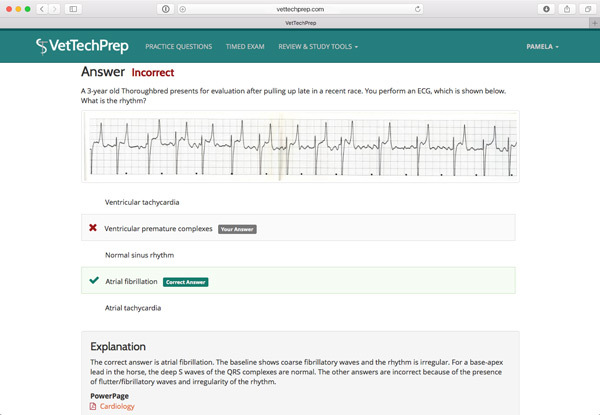 VetTechPrep offers detailed answer explanations for students when questions are answered. The questions and answer choices are clearly explained so the student can fully understand the material. Our program also includes PowerPages - condensed notes on important board review topics as PDFs. These can be printed out to study and used as a supplemental learning tool.